Experience the raw beauty of Namibia on horseback and journey through an untamed landscape with riding holiday specialist, Ranch Rider. Canter across the Namib, the world’s oldest desert; spy the majestic Fish River Canyon from atop your mount, encounter desert adapted elephant in Damaraland, and ride with oryx, ostrich and mountain zebra across one of the largest private nature reserves in Southern Africa. Having adapted to the sun-blistered plains of Damaraland, herds of elephant are encountered seasonally along the Huab and Ugab Rivers; rhino, oryx and springbok also inhabiting this ruggedly beautiful region. Additional highlights include, a sunset ride at Twyfelfontein, the World Heritage site home to ancient bushman paintings and horseback adventures along the remote Skeleton Coast - one of the most captivating, yet least visited places on the planet. 10 night Damara Elephant Ride from £3,975pp (two sharing) including all riding, accommodation (eight nights camping & two nights lodge based) all meals and drinks whilst camping, ground transfers and return transfers. Excludes return flight to Johannesburg or Cape Town and internal flight to Windhoek. 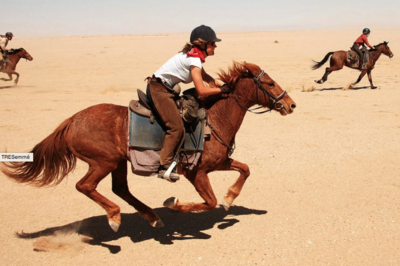 Journey across the Namib Desert on this challenging 440 km ride. Traverse the rugged terraces of the Kuiseb Canyon and Moon Valley's luna-esque landscape, a variety of wildlife including gemsbok, giraffe, mountain zebra and ostrich often spied en route. The Tinkas, Tumas and Welwitschia plains also feature on this exotic once-in-a-lifetime horseback holiday, the trail taking you from the Khomas Hochland mountains through to the Atlantic Ocean. 10 night Namib Desert Ride with from £3,670pp (two sharing) including all riding, accommodation (eight nights camping & two nights lodge based) all meals and drinks whilst camping, ground transfers and return transfers. Excludes return flight to Johannesburg or Cape Town and internal flight to Windhoek. The first and last night of each ride is spent at either guest farms/houses or lodges, with riders camping out in two man tents for the majority of holiday. Ranch Rider offers add-on self-drives in Namibia, the country recently featured on ITV’s “Slow Train Through Africa,” the series hosted by comedian and presenter, Griff Rhys Jones. In Nambia, Jones visited The Africat Foundation and Etosha National Park, the country’s permier wildlife viewing destination. From £575pp (two sharing) including car hire and accommodation. For more information, visit ranchrider.com.